Chibi Maruko-chan, one of Japan's longest-running animated shows, has had a slight change recently. The titular character, Maruko-Chan, got a haircut, and Chinese fans are having a field day. That's right, Chinese fans, in China, are reacting to a Japanese anime character getting a haircut. In the recent-ish 936th episode of Chibi Maruko-Chan, Maruko-Chan changed her iconic style. Her normal 'do, an almost helmet-like hair with bangs, has been the norm since Maruko-Chan debuted in comic form almost 30 years ago. In the episode in question, Maruko-Chan had her hair cut, removing her iconic bangs and showing more of a Bieber-esque bowl cut. Here is an image of Maruko-Chan before and after! Chinese fans, many of whom grew up watching the show, had pretty positive reactions. Some of the reactions are even adorable, for instance Chinese actress Jiang Xin's "cosplay" of Maruko-Chan. Jiang, who is famous in China for her role as one of the many consorts of the emperor in the Chinese historical drama The Legend of Zhen Huan(后宫甄嬛传), took to her Sina Weibo microblog to show off her portrayal of Maruko-Chan. Below, we've translated some of the better reactions to Maruko-Chan's new hair. Hahahahahaha! Maruko-Chan, when did you change into this bucket hair? Perhaps you had a haircut accident! Do you like this version of Maruko-Chan? I finally watched the new episode! 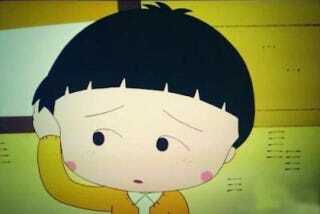 Maruko-Chan's haircut is just way too adorable! Maruko-Chan has always been adorable. Finally saw the episode on youtube. Super adorable, I really like it. However, it looks like this is only for one episode because in the teaser for the new episode, her hair is back to normal. Your hair grows so fast! Maruko-Chan, you are too cute!! Eric is a Beijing based writer and all around FAT man. You can contact him @FatAsianTechie@gmail.com or follow him on Twitter @FatAsianTechie.